My Wandering Life: Walking with Dinosaurs! 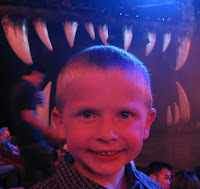 Last night we went to see Walking With Dinosaurs - The Live Experience, which was wonderful! Based on the wildly popular BBC documentary of the same name, it plays in large arenas like the Staples Center in LA or the Honda Center in Anaheim, which is where we saw it last night. The spectacle features life-sized (whoa are they BIG!) robotic dinosaurs operated by drivers and puppeteers, and a paleontologist narrator who takes you back in time and tells you about the dinosaurs in a cool, non museum-like way. It was clever how they tried to tell a story to go with these amazing dino-puppets, simple set pieces, and wonderful light effects. The boys were captivated by how lifelike they were - Ben asked if the tallest of the dinosaurs would be able to reach him in his seat and eat him. I said that he might reach us, but that he was a vegetarian so we were safe. Here's to the happy couple! Magic Kingdom, here we come!